Soul Asylum kicked open the show with a fairly laid back set. The weather hadn’t quite made up its mind and was drizzling on fans as they trickled in. 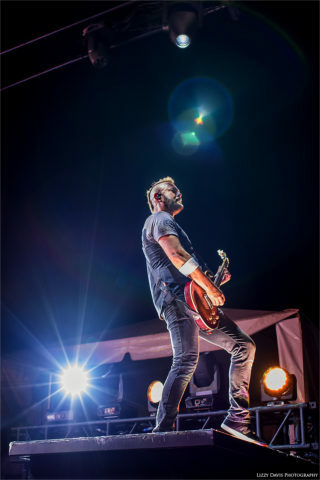 At the end of “Whatcha Need” guitarist Ryan Smith amped up the energy a little bit, dropping his guitar on stage and stepping on it repeatedly to mute the song ending. 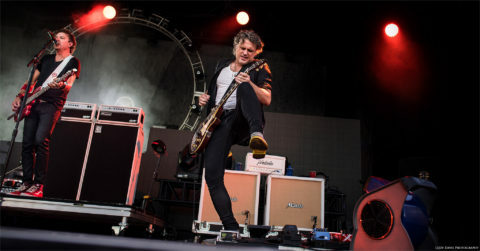 After picking his guitar back up, they broke into the 1994 “Best Rock Song” Grammy winner, “Runaway Train.” Soul Asylum’s set was a mere seven songs, closing with “April Fool” while kneeling on the stage and blowing kisses to a well receiving crowd. 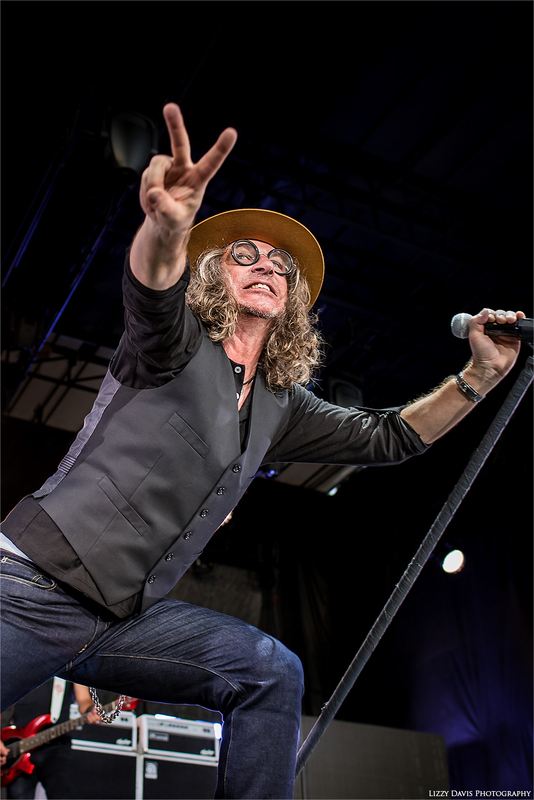 After a brief set change, Collective Soul hit the stage running, opening with “Now’s The Time”and “Over Me.” Vocalist Ed Roland took a seat at a piano placed on the right-hand side of the stage and broke into the recognizable intro of 1993 hit, “Shine.”The entire band had clearly warmed up by this point, with Roland energetically jumping during the breakdown of the song and playfully tossing his hat across stage at the end of the song. 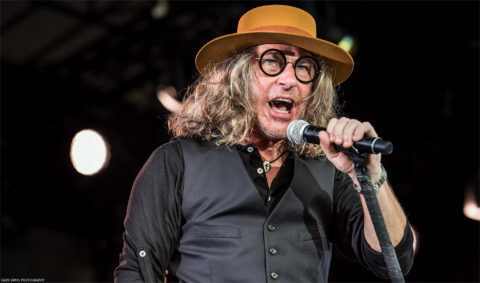 Roland also touched upon The Beatles being one of rock music’s defining bands and how they have many different styles of songs (particularly noting “Hey Jude” and “HelterSkelter”). He continued, “It’s okay for people to have different opinions. Just don’t be assholes, and when you learn to do that, we will all ‘Gel’…” an apt prelude into the song. The clouds had cleared and a beautiful sunset painted the skies opposite the stage, which Roland took an opportunity to point out to the crowd following the conclusion of “Where the River Flows.” Roland took a moment to introduce his multi-talented brother and piano player, Dave Roland. The two shared a hug, just as the heartfelt notes of “Run” began playing in the background. 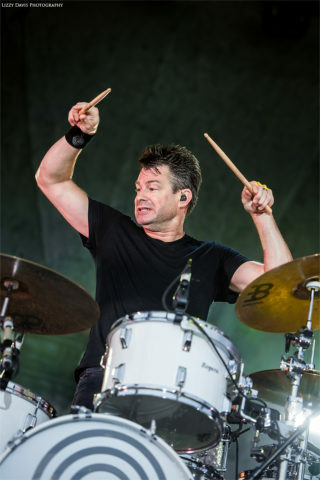 Toward the end of the song, most of the band put down their instruments, with just Roland continuing to play the song on acoustic guitar and drummer Johnny Rabb joining in with a small tambourine part while the rest of the band embraced, bowed and said goodnight to the crowd. 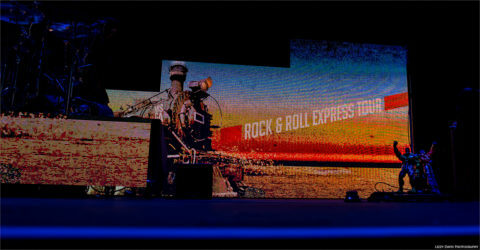 By 9:00, the sun had fully set and colorful LED backboards now lit up the stage, displaying an image of a train and banner for the tour. 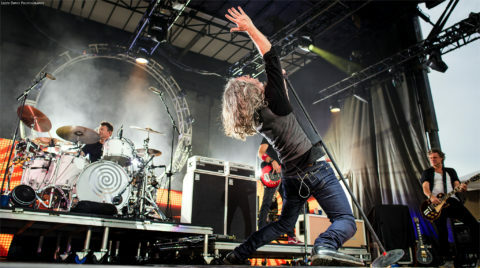 Collective Soul left 3 Doors Down with a tough set to follow, but the crowd cheered with anticipation when the lights dimmed. 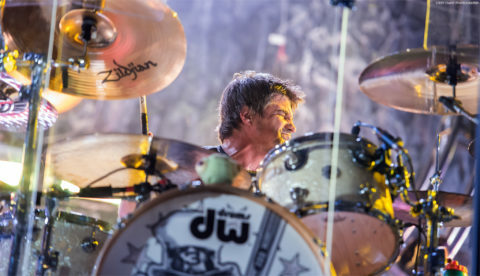 The cheer carried throughout as 3 Doors Down guitarist Chris Henderson and bassist Justin Biltonen took their places on each side of a riser behind the drum kit. The two began strumming the opening notes of “Duck and Run,” still standing mostly in darkness. A slight pause filled the air, then a massive CO2 blast and a wash of lights brought the stage to life as the remaining members came out and broke into song. 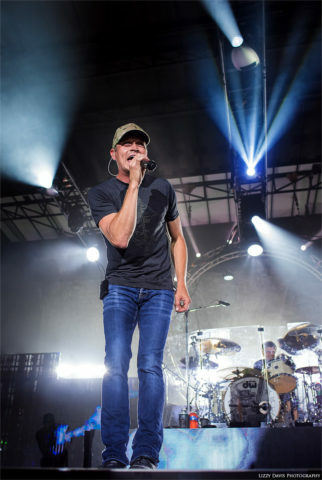 With over 20 years in the industry, 20 million album sales and 6 studio albums, 3 Doors Down is a well-oiled machine with dozens of chart-topping singles. 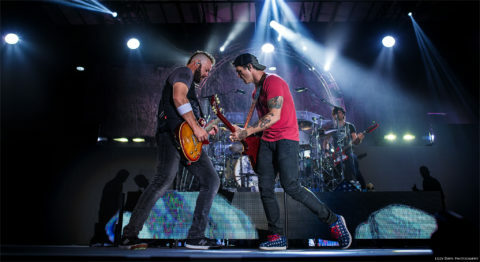 Their latest album ‘Us and the Night’ dropped just over two years ago, but this tour focused less on supporting that release and more on all the songs every fan wants to hear. 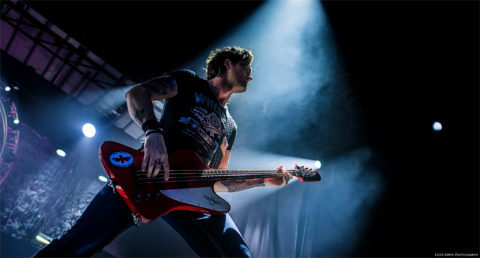 “Away from the Sun,””Be Like That” and “Loser” were just a notable couple scratching the surface of their 17 song long setlist. 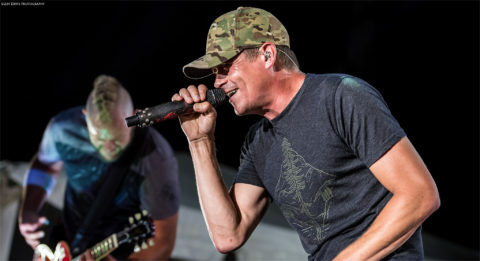 Vocalist Brad Arnold sounds as good live as he does in studio and saved most of his voice for the music aside from joking about the FL heat stating, “Someone might’ve left the heater on…” and being sure to express his gratitude and thanks to the crowd after nearly every song. It’s always easy to tell when a show is coming to a close based on when the signature songs are played. “Kryptonite” had everyone up on their feet dancing, especially when the band broke the last verse down into a Hawaiian-esque, reggae-style version, perfectly appropriate for Florida. 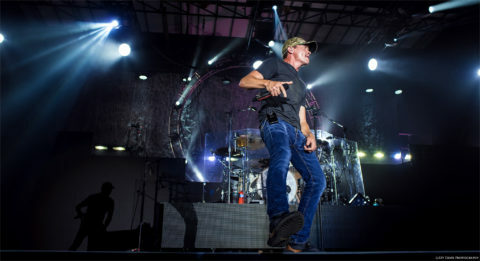 3 Doors Down left the stage briefly before Arnold returned with Henderson to play an acoustic intro for “Here Without You,” later being rejoined by the rest of the band. Arnold took one more opportunity to address the crowd, first asking, “Do you want one more? 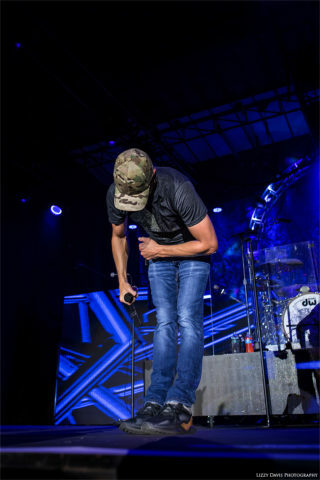 !” then graciously dedicating the final song “When I’m Gone” to military, firefighters, police officers and other service members.